You may be very familiar with the situation like this: When you are enjoying the beautiful photos on your iPhone 5, 5s, 6/6 plus, 6/6s plus, or even the newest iPhone se, suddenly the software or device crashes and you lose all your photos. Really annoying, is it? Actually in the daily life, iPhone users often suffer photo loss due to various reasons, such as, accidental deletion, formatting, system crash, virus attack, factory settings restore, jailbreak, etc. Are you looking for a way to get your precious pictures back? Don’t worry. 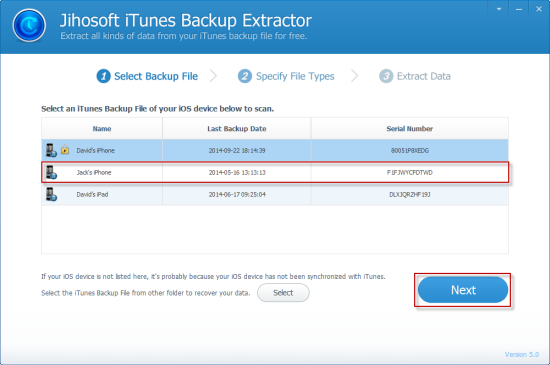 Here we strongly recommend you a powerful iPhone data recovery application, iPhone Backup Extractor Freeware, which can help you extract and recover photos from iPhone Backup free. 1. Retrieve not only iPhone photos, but also messages, contacts, call history, videos, notes, WhatsApp, and more from iTunes backup. 2. Supports all popular iPhone devices, for instance, iPhone SE, iPhone 6S, iPhone 6S Plus, iPhone 6, iPhone 6 Plus, iPhone 5S, iPhone 5, iPhone 4S, iPhone 4, as well as iPad Pro, iPad Air 3, iPad Air 2, iPad Air, iPad mini 4, iPad mini 3, iPad mini with Retina Display, iPad mini, the new iPad, iPad 2, iPad 1, iPod touch 5, iPod touch 4. 3. Preview all scanned data in detial and selectively recover specified photos or other data that you exactly need. 4. Entirely free with an exquisite interface. Step1. 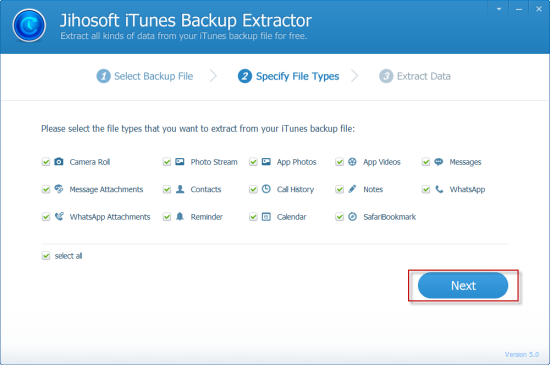 Open the free iTunes Backup Photo Extractor and choose an iPhone backup file. Step2. 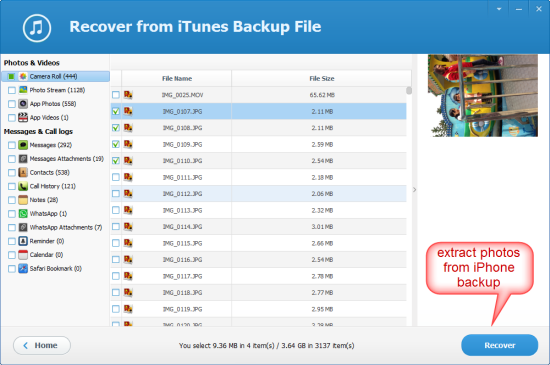 To extract photos from iTunes backup, you can select Camera Roll, Photo Stream and App Photos from the listed file types. Of course, you can still choose “select all” to scan all data in the backup. Step3. After scanning, preview and mark the photos you need, then click on the “Recover” button. * While using this freeware, if your iTunes backup is encrypted, you should input the password to scan the backup file. And you need to upgrade to the Pro version to export and save photos to your computer. * To prevent accidental photo loss from iPhone, regular backup is necessary and of great significance. Besides Apple iTunes and iCloud, you can make good use of iPhone Data Transfer to backup iPhone photos and other data. Also, you can restore data to iPhone from backup with ease. * If you don’t have any available iPhone backup, how to retrieve lost photos? Don’t worry. iPhone Data Recovery will help you restore photos from iPhone directly. What you need to do is connect your iPhone to the computer and let the program scan your device deeply.